How It’s New York: The Masters in Collaboration series was founded here in NYC, by NYU’s own Mick Moloney (NEA Heritage winner), at Irish Arts Center. This was the sixth installment. How It’s Irish: The musicians always included at least one Irish musician. This one brought together old style, sean nós singing from Iarla Ó Lionáird and uillean pipes from Ivan Goff, two forms of music that come from deep inside Irish tradition. To see the two interact together was magical. Then there was the addition of Dan Trueman on the Norwegian hardanger fiddle, which is an instrument becoming more and more popular in Irish trad these days. It’s gorgeous and I’m all for it. I want one. This review first appeared in Irish Examiner USA, October 4. 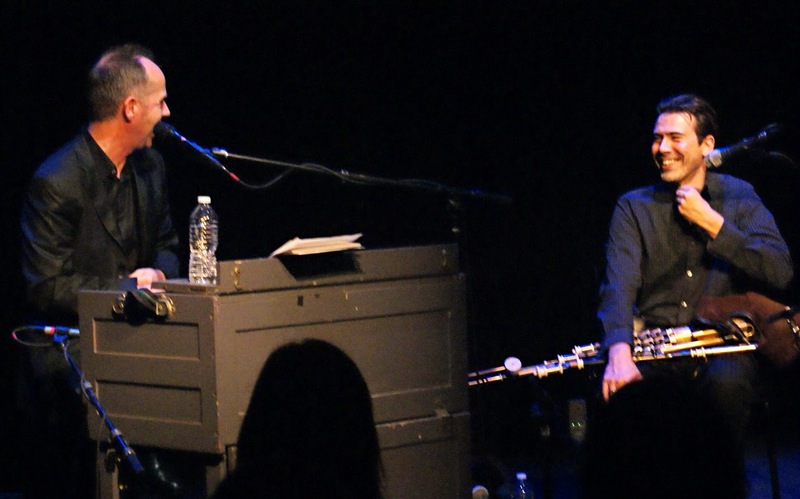 That’s what happened tonight when Iarla O Lionaird met Ivan Goff in Irish Arts Center’s sixth installment of the Masters in Collaboration series. The pairing seems strange to those not deeply immersed in traditional music: Iarla is a sean nos (Old style) singer, who has sung with Afro Celt Sound System (earning two Grammy nominations) and is now with the rising band the Gloaming (with pianist Thomas Bartlett, guitarist Dennis Cahill, fiddler Martin Hayes, Iarla O Lionaird, hardanger innovator Caoimhín O Raghallaigh, the band had its first concert in August, look for their first album this winter). Ivan is an all-Ireland uillean piper/flutist who has played with Riverdance and Eileen Ivers and Lunasa, to name a few. But there is a connection between the ornamented solo sound of the pipes and the plaintive, pure sound of sean nos singing, and the pairing demonstrated that. Each imitate one another and strive to sound like the other. When dancing around one another the effect was unforgettable. Overall? I didn’t learn as much as I would have had Mick Moloney led his usual midweek conversation – visa snafus kept Iarla from arriving until midweek. Mick conducted an interview Saturday night. In addition to singing, he also played a harmonium, leant by Cleek Schrey. In between long sets, he kept up a running comic commentary, riffing on the slow, sad aspect of the airs. “The interval is very useful because if you forgot, you can take your medications then,” he said. Iarla pointed out that only 5-7 years ago, people were “yawning” at the theme of emigration. Now it’s back again. Though titled a lament, the major key provide a sense of peace, perhaps an otherworldy peace. It transformed seamlessly into a delicate jig. Gorgeous. Dan Trueman then joined them onstage. Dan is a hardanger player – a Norwegian fiddle, decorated elaborately, with a set of strings resonating beneath the four main strings. I think he’s right – the sound supports the music and adds something to it. After spending a year in Ireland, Dan now teaches Composition at Princeton, where he runs the Making Tunes! Series (next up is Caoimhin O Raghallaigh and Brendan Begley on October 20). He got the song from a cassette recording of his great-aunt Elizabeth Cronin, who was a famous sean nos singer, recorded by Alan Lomax. The song was written with alternating verses in Irish and English, as many songs were from that West Cork gaeltacht area, Cuil Aodha, Iarla’s home. He demonstrated part of a song written line by line in Irish and in English that made everyone laugh (you can’t help the feeling the really naughty bits are in Irish). A collection of tunes elegizing the pre-industrial life opened with Ivan making breathy, percussive noises on the flute that contributed to a sorrowful tone. “The Peeler’s Jacket” was transformed by the hardanger, with its sevenths and diminished chords, into something complex and uneasy. The final piece, “Samradh Samradh” (Summer Summer), with all three performers, had enchantment in it. It expressed hope and promise, filtered through virtuosic yet subtle skill, particularly that of Dubliner Ivan Goff, who began simply providing repeating notes, reminiscent of crickets humming, on the pipes, then switched to whistle to catch Iarla’s melody, with a simple force. Dan’s droning fiddle caught the melody too as Iarla’s voice soared above. It then morphed into a lacy jig, Kaiser, led by Dan, then picked up by Ivan on the pipes. These are the musical collaborations that this series was born to foster.